It was love at first sight. I saw those sweet brown eyes in the photo and something told me she was the one. Emery, now Bean, was found as a stray in Oklahoma. I had been following the Skiatook Facebook page for a while and had seen a lot of dogs I’d love to adopt, but Bean just stood out. It’s a long story, but my mom’s landlord’s daughter’s wife’s sister, (I told you it was a long story) Kirsten Williams, works for Skiatook Animal Control, along with Skiatook Paws and Claws Rescue. 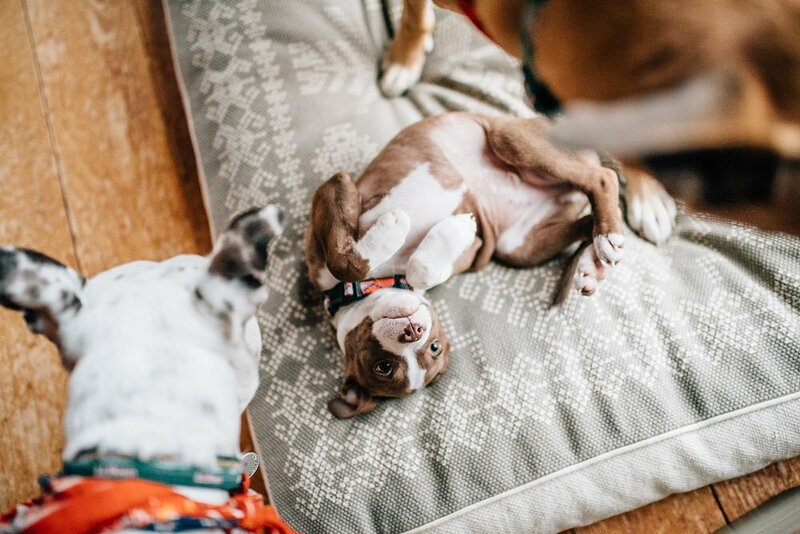 So through our mutual friend Julianna sharing their photos on Faebeook, I connected with Kirsten over our mutual love for rescue dogs and photography. She photographs dogs so beautifully and gives them the best chance at getting adopted. Knowing she may be able to help me get Bean to Maine, I commented on her photo, saying “ This one!” Another Oklahoma connection and dog lover, Alexandra Miller, tagged Lindsay and it began: Bean’s journey home. Kirsten, Paige, Lindsay and Alexandra started figuring out how to get her here after my application was approved. Lindsay, an absolute angel of a human being, offered to foster her until I could fly out to pick her up. She had just said goodbye to her dog of 16 years, but had it in her heart to become Bean’s foster. I felt an overwhelming sense of gratitude to these ladies who made this happen within a few days. Everything came together to get this dog to Maine. In the meantime, three other Maine based families fell in love with pups online and it turned into a 4 dog adoption trip. I sent in the adoption fee, booked my tickets and rental car, and the trip was a go! Facebook can be a wonderful thing! I flew into Tulsa, picked up my rental car and drove to a Target parking lot to meet up with all of the fosters. Everyone was so happy that the dogs were finding new homes, but it seemed hard to say goodbye to their little foster puppies. Wasp (now Mookie), Peanut (now Wesley) and Mary Jane (now Acadia), were loaded into the back of my car as I waited for Bean to arrive. I was nervous.. what if she didn’t like me? Or the other dogs? Or hiking? Or snow? My heart raced as I saw Lindsay’s car pull into the parking lot. It was all a blur, but what I do remember is Bean running out of her car and into my arms. It was if she knew I was her new home. I put her in the front seat next to me and I’ll never forget the look she gave me as we drove away. It’s as if she was saying “thank you”. I cannot stress how important those fosters were in this whole operation. They willingly took 4 stray dogs into their homes and gave them love, a warm bed and food while they awaited their freedom ride. Fostering saves lives! Our 26 hour, 1600+ mile trip begins! Rest stops and Petco parking lots became my new best friends. Taking the pups out one by one, making sure they all had plenty of water, and feeding them each their specific food or medications took time, but I began to get to know each dog’s personality and quirks. Wesley didn’t like loud noises, Mookie was the fiesty one and Acadia loved to sit. Done eating? Sit. Walking on leash? Sit. It was too cute. Bean was a great co-pilot, very calm and loved snuggling up in the front seat as we drove for hours. While at times it was tough to manage all four dogs, I’d find myself smiling as I looked at the kennel in the back, knowing they were going to have the best lives ever. I slept in my car the first night, as finding hotels that are dog friendly can be tough. I finally found a La Quinta that would allow me to bring all 4 dogs in. It was the first time all of the pups had been free together. They sprinted all over the hotel room! I fed each pup in the bathtub while the others watched (im)patiently for their turn. They discovered the mirror and couldn’t believe another dog was looking right back at them! Pitstops + pitties. The only time I didn’t go through the drive through was when I found an outdoor patio to sit on in Columbus. It was my first meal out of the car! It felt great to have some human interaction and delicious food. I told them the story of the dogs, as each member of the wait staff came out to meet the dogs. When I got my bill, my meal had been paid for. I smiled as I packed up the pups to continue our journey. I drove 6 hours Wednesday, 12 hours Thursday and 10 hours on Friday, landing me in Boston on Friday night. I dropped the rental car off and met up with my brother Chris and his girlfriend Britney, who picked me up and got to meet their new puppy! Britney’s face says it all! We drove to Portland to meet up with Sarah and Shawn. When I took Wesley out the kennel, they held him in their arms and kissed his sweet puppy head. I felt like Santa Claus delivering the best gift of all. Finally home at midnight, Bean met her new family in a whirlwind as I fell into bed. I was incredibly exhausted but so happy to be back. The next morning, Lilah showed Bean all of her toys and how to run around in the yard. They played for so long and then napped! Sam, my older dog, hasn’t always loved all dogs, but immediately accepted her into our family. It was so beautiful to see our family grow and have them get along so well. A few hours later, it started snowing! Bean didn’t know what snow was. She sniffed and licked the snow, shaking her head in surprise when she realized it was cold. We put her new fleece jacket on and my little southern belle started to understand that snow was FUN! Brit and Chris live with us in our 1820’s farmhouse in Western Maine, so Acadia is more of a longterm resident! She loves her big cousins and plays with them all day! Bean went on her first family run and loved it. Seeing her run free through the woods made my heart explode with happiness. We said goodbye to Mookie on Saturday night. She was off to meet her new family, Chelsea, Ian and their two sweet daughters. Chelsea, my dear friend and talented photographer, sent these photos to me the next day. I think it’s safe to say she’s found the right home! To the folks at Skiatook Paws + Claws / Animal Control, THANK YOU. Thank you for what you do, day in and day out, to save these animals. You make a difference in their lives and in ours. I knew that Bean needed me, but I think I needed her more. I feel lucky to be her mom. She’s already become a part of our family and she most certainly has found her forever home. Bean- thank you for reminding me that everyone deserves a second chance. I can’t wait to show you the world.